Directed by Sergei Eisenstein and written by Eisenstein, Grigori Aleksandrov, Ilya Kravchunovsky, and Valeryan Pletnyov, Strike is the story of a worker’s strike in 1903 Russia and the aftermath that would set the seeds for the Russian Revolution of 1917. The film is a dramatic depiction of the strike as it is told in six parts playing into the events that helped change the idea of Russian society. Starring Grigori Aleksandrov and Aleksandor Antonov. Strike is a gripping yet rapturous film from Sergei Eisenstein. Set in 1903 and told in six chapters, the film follows the events of a worker’s strike from the moments that sparked the strike to the eventual outcome that later served as a template for Russia’s revolution that would emerge more than a decade later. The film’s screenplay is broken into six chapters as the first relates to the life of the workers and management and the second is about a worker who is accused of theft over a lost micrometer that was supposedly stolen forcing him to hang himself to death. This leads to a major strike with workers wanting demands and the response from management that eventually lead to all sorts of chaos and terror. Especially as there are those who working for management as spies who want to destroy the hopes of these workers. Sergei Eisenstein’s direction is definitely stylish in his approach to compositions as well as creating scenes that definitely play into something that feels real. While it is shot in the full-frame aspect ratio of 1:33:1, Eisenstein is able to get a lot of coverage in the framing as it relates to the scope of what is happening in those times. The usage of wide shots to capture some of the riots and battles between workers and military in the film’s third act is evident as Eisenstein would also include some impressionistic shots with its usage of shadows and light courtesy of a trio of cinematographers in Eduard Tisse, Vasili Khvatov, and Vladimir Popov. 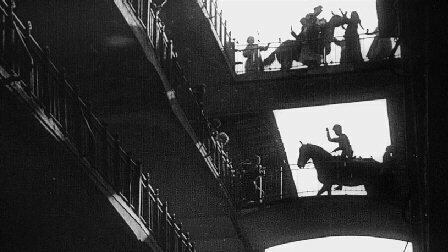 Notably in scenes during the third act of a riot in an apartment building where the lighting and the art direction of Vasiliy Rakhals would come into play along with dizzying editing that is heavy in montage but also to play into this sense of style with its rhythms and superimposed dissolves to showcase the chaos of these riots. There are also some light-hearted scenes in the film as it relate to the life of the workers who are just common people helping each other out and want what is best for themselves and their children. It’s a sharp contrast to the scene with the shareholders and managers as they’re shown in close-ups and medium shots to show that they not only do they not care about what the workers want but discuss it while having cocktails thinking they’re above the workers. The direction would have Eisenstein bring a realism to the actors in their performance as it help provide that need to capture what is happening as it feature standout roles from Maksim Shtraukh as a police spy, Grigori Aleksandrov as a factory foreman who is assaulted by the workers, and Ivan Klyukvin as the head revolutionary. Overall, Eisenstein creates a mesmerizing yet intense film about a worker’s strike in pre-Revolutionary Russia. Strike is a phenomenal film from Sergei Eisenstein. Featuring incredible visuals, masterful editing, and a look into a period in time that would set the seeds for a historical event. The film is stylish silent film that showcases many of the visual ideas that would come as well as presenting a historical moment with an air of realism and power. In the end, Strike is a spectacular film from Sergei Eisenstein.